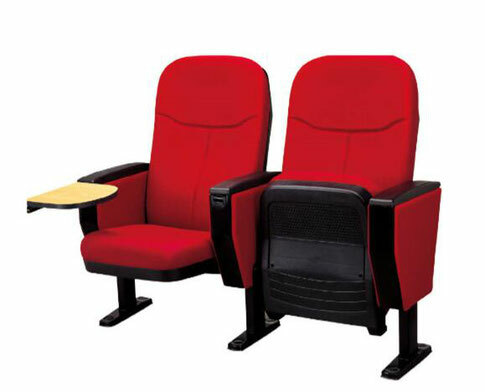 Wooden auditorium chairs clean up there are requirements. Wood materials should avoid beverages, chemicals or overheated objects placed in the surface, so as to avoid damage to the natural color of wood surface; leather material absorption, should pay attention to pollution; leather material should be used leather special cleaning agent cleaning, avoid using strong detergent. Metal auditorium chair clean have stress. The maintenance of the metal material can use a soft cloth to wipe, but avoid using rough, organic solvents, such as loose fat, decontamination oil) or wet cloth, these are caused by surface scars, the main reason for the rusty. Often use dry cotton or silk cloth wipe, to keep bright and beautiful. Soft cloth to dry the cotton auditorium chair, and then drying. Fabric maintenance prohibit the use of cloth, a hard object or acid and alkali material exposure to chemicals, so as not to affect the surface quality and the use of the cycle. If you stick to drink, juice, can be used to wipe the hand towel to absorb moisture, and then with warm water to dissolve the neutral detergent to wipe, and then use a clean soft cloth to dry, and finally to the low temperature drying. Water quality cloth auditorium chair, then drying. General maintenance only use a clean soft cloth gently wipe, if you want to clean up the long-term use of dirt, the most ideal way is: first of all, use warm water diluted neutral detergent first wipe, and then to dry clean water cloth to wipe clean, and finally to dry cloth polishing, after all the use of appropriate amount of maintenance agent evenly wipe.